With oil at about $33 a barrel the Aberdeen economy is suffering. The anecdotes abound: For example, the taxi driver who tells you that his takings are down by 50% and that his last fare on a business visit to the city had been the sole occupant of the hotel. Aberdeen has become largely dependent on oil over the years. There had been other industries in the city, fishing, shipbuilding, papermaking, textiles and tourism amongst others, but they all declined or disappeared. Here’s an anecdote that illustrates this only too well. When I attended my children’s prize-giving ceremony at Harlaw Academy in 1998, the invited speaker was the manager of the John Lewis store in the city centre. The theme of his talk was local job prospects, particularly oil. He mentioned in passing that the store’s annual profits closely tracked the oil price, year in, year out. By 1998, the industry had come to dominate the Aberdeen economy. The Aberdeen economy now lacks any significant diversity, something all too apparent now that the oil price has crashed. Recent discussions have focussed on expanding the local economy by encouraging the development of biopharmaceuticals and agrifood industries. A similar weakness has been identified in Norway with its dependence on oil. The BBC recently reported that the Norwegians are seeking to diversify with potential growth in aluminium, healthcare, farming and fisheries (it was noted that the shop price of a 4.5kg salmon shops is currently worth more than a barrel of oil). Nevertheless, Aberdeen will probably tough things out until the oil industry revives. Let’s put a caveat on that – should the current slump last not much longer than one to two years. The key feature to emphasize is that oil is of enormous strategic importance to the national economy, both in the UK and Scotland, and more than just its massive tax-raising boost. Whereas, the country’s power generation may be satisfied by Chinese nuclear energy, even renewables, oil is needed for transport and is irreplaceable for the purpose until alternatives such as hydrogen fuel cells and electrification of the transport grid comes to the fore (the green initiative is to be applauded but it hasn’t happened big time yet). The need to import oil can cripple a weak economy as was all too apparent in 1973 when the oil price quadrupled at a time when the UK economy was in trouble. The lessons of the 70s hopefully have not been lost on government officials. The UK economy is not exactly rosy today either, and it would be wise not to have to import all the country’s fuel at a high oil price once the upturn comes. A significant rise in the oil price could easily happen in the medium term. Oil price crashes result in a drastic cut in oil company investment, typically on projects which have a lead time of several years. When energy demand increases, an adequate supply is not then available and the price can rocket. Thus the UK government is aware of the need to support the North Sea oil industry by cutting its taxes on oil production and is likely to continue doing so in the short to medium term. In the long term, the large tax revenues will eventually return. Another factor concentrates the UK government’s collective mind here, the vast cost of abandoning North Sea oil and gas infrastructure. Oil companies are required by international agreement to remove most of the offshore infrastructure; mainly oil platforms and pipelines. The government will be responsible for funding part of the costs, an estimated £16 billion out of £55 million in total by 2050. Given current government spending constraints, they will want to postpone the expenditure for as long as possible. Unlike say coal or steel, leaving the oil industry to die bites the government where it hurts. It is vital to keep some sort of oil industry present in the Aberdeen area to form the basis for reviving the industry in the future. A vast infrastructure of platforms, pipelines and terminals are already in place. If this goes, the industry goes and is unlikely to come back. Certain key fields act as hubs with their pipeline links for transporting oil onshore. These matter to the future of exploration of new oil in the North Sea. New oil finds are typically small and would probably not be economic without an existing infrastructure in place. The longer the infrastructure is kept in place, the higher the oil recovery will be from the North Sea. Another key feature of the Aberdeen area is that there is a large and very experienced oil and gas skill pool in the city. They should be encouraged to stay here for as long as possible or else they will drift off and find alternative careers. A city deal was announced for Aberdeen at the end of January this year. It’s an investment package of £250 million jointly provided by the UK and Scottish governments. The money will be used to expand Aberdeen harbour by building an extension at the Bay of Nigg, to improve digital connectivity, and to fund an energy innovation centre. The intent of the centre is to work with small and medium-sized businesses to develop new technology in the oil and gas sector. There is also a proposal on the table to build a new energy centre at Aberdeen University. The benefit of such a centre is tangible. The recovery of oil from the North Sea is top in class, many new technologies have been developed here and the rest of the industry sees the North Sea efforts as an exemplar to copy. If and when the upturn happens, the industry will require a large number of trained engineers and geoscientists to cope with projects that have become economic again. In parallel, the Scottish government announced that it would provide funding to improve the rail links on the east coast. A major issue is the journey times north of Dundee where a single-track stretch of railway at Montrose causes a bottleneck. There have been plans to remove this problem for years although it is yet to come to fruition. The work should now start in five to ten years time. It is to be hoped that the Scottish government will finally honour this pledge. A major issue for the future of Aberdeen is its poor transport links with the rest of the UK given its relatively remote location. Unless these are improved substantially, Aberdeen’s prospects for an economic future after oil are somewhat limited. The North Sea oil industry is therefore on life support and the patient is critical but not necessarily croaking. Aberdeen should survive as an energy city going forward providing the downturn in the oil price doesn’t persist too long and the tax breaks come. Next week, we start to look at the long term future beyond oil; starting with what I call the scrapheap challenge: the decommissioning of North Sea oil infrastructure. Very interesting and relevant, Mike! I would predict that the North Sea offshore oil industry will be unlikely to revive. To add to the points Mr Shepherd made in ‘part 1’ of his series of articles, there has always been a massive supply of cheaply produced oil. Despite this the price of oil rose much higher than its productive cost because the US and then European oil, car, and arms corporations made sure the world economies became heavily dependent on oil. This resulted in crises when the supply was interrupted in 1973 by the Yom Kippur War and on 1979 by the Iranian Revolution. 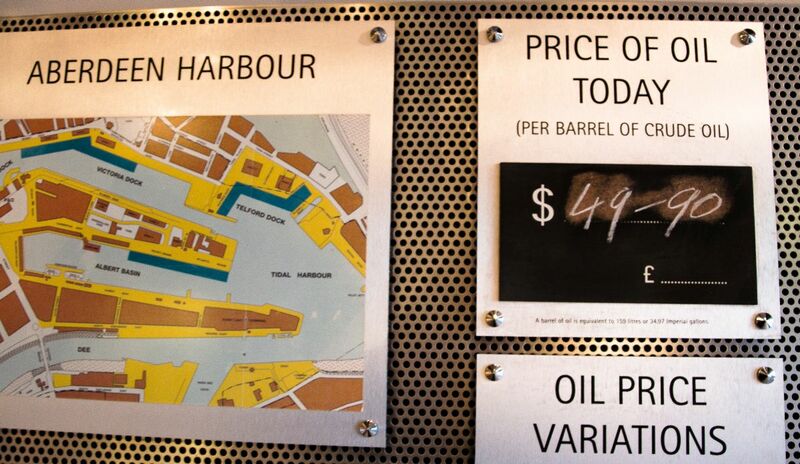 The need to obtain more control over oil supply and the perception of a limit to supply (i.e. peak oil) led to the encouragement by governments and corporations to seek out and exploit reserves outside the low cost productive fields of the Middle East and Venezuela, resulting in more costly extraction from more marginal and difficult environments. The high cost of oil funded this. To encourage and maintain continual investment in oil, the oil corporations had to maintain the confidence of investors by demonstrating there was continual scope for supply and future growth, further encouraging the move to marginal fields. The exploitation in the extreme North Sea environment gave rise to the technologies and skills of the North East for exploitation in marginal offshore locations throughout the globe. This expertise is now rapidly becoming redundant as there is becoming less need, and less investment for exploiting the expensive marginal fields. The existing glut in oil supply has now been increased by the expanding oil fields across America and by previous sanctioned and disrupted suppliers coming back on to the market (Iran, Iraq). Oil producing countries dependent on oil revenue such as USSR, Venezuela, Nigeria need to put greater volumes on the market to support their economies no matter how low the price. Now with threat of climate change is becoming ever more understood and accepted – (global warming deniers are now a more threatened species than polar bears). There is now a trend to divest, for ethical reasons, from oil by universities, churches, local governments etc. On the financial spectrum, more clued up investment managers are noticing the decline in oil company dividends, and realising that a third of existing resources can’t be burned,are looking to move away from potentially stranded assets. On the other hand combined with the massive growth in renewable energy other sources of power are becoming more attractive. The motor vehicle industry is massively investing in electric and battery technology. With, estimated, only 16 years until the 2 degrees limit is reached, rapid movement from fossil fuels is essential for world stability. Unfortunately for North East Scotland, but fortunately for the future of the planet, the trend appears to point to a continual decline in oil as the means of powering the global economy.